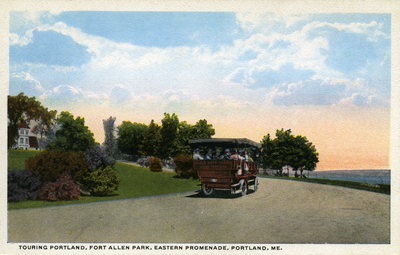 "Touring Fort Allen Park, Eastern Promenade, Portland, Me." Touring Fort Allen Park, Eastern Promenade, Portland, Me. General view of Fort Allen Park, from southwest. Roadway in foreground. Auto Tours covered vehicle at center. Casco Bay at right. "Touring Fort Allen Park, Eastern Promenade, Portland, Me." (2017). Portland Postcards. 41.